Welcome to DeWyse Construction, Inc. Upper Peninsula Seamless Gutter Systems - manufactured onsite & built to last. We are your LEAFPROOF Authorized Dealer for the Central and Eastern Upper Peninsula. Our Seamless Rain Gutter Systems are customized to fit your home and your needs. We manufacture high quality gutters onsite to ensure a perfect fit. Using only the best of the best products, DeWyse Construction, Inc. measures out your entire home and evaluates the project from top to bottom. This process ensures that you will be happy with the color, its performance, and the long lasting product that we produce! We only use the highest quality products. Our Seamless Gutters are comprised of .032 aluminum - the thickest aluminum available on the market today. We also have 32 colors to choose from - to ensure an aesthetically pleasing outcome. Our LEAFPROOF Seamless Gutter System is customized and many types of structures. 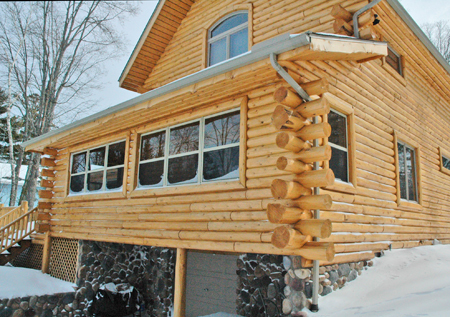 Log Homes, timber structures, modular, and more can all be enhanced and protected by a seamless gutter system. Protect your investment by calling or emailing us today. Our commitment to uncompromising integrity and quality will give you a project that is an investment that appreciates with age. To us each structure should be regarded and constructed as an heirloom to be passed on from generation to generation. Protect your structure today. 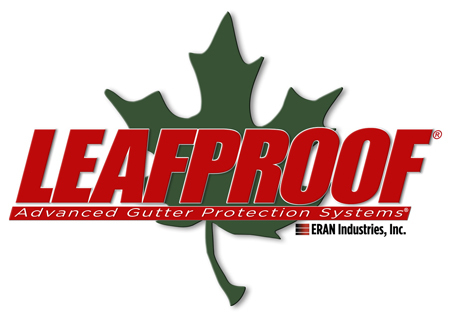 LEAFPROOF is the fastest growing gutter protection company in America. Clogged gutters and downspouts cause millions of dollars in damage to homes every year and are dangerous to clean. 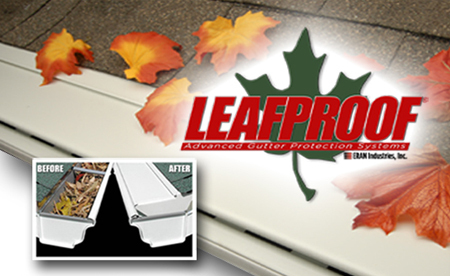 With LEAFPROOF installed, your gutters and downspouts will be debris free. DeWyse Construction, Inc. can help protect your Upper Peninsula home with the installation of Leafproof along with our Seamless Gutter System that we customize for your home. Available in many colors, click here to visit www.leafproof.com for more information on colors and styles. Upper Peninsula winters can be extreme. Make sure to protect your investment with a product that is unique and proven to work. 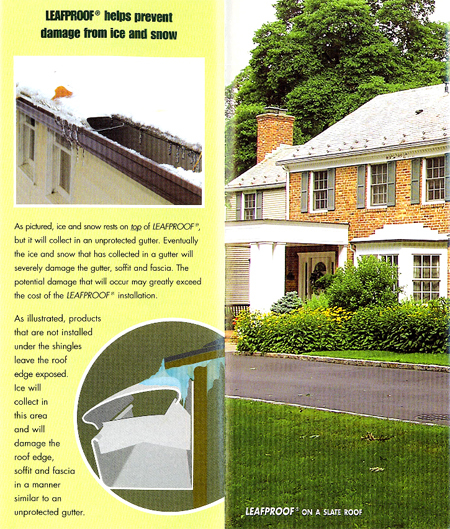 "As pictured, ice and snow rests on top of LEAFPROOF, but it will collect in an unprotected gutter. 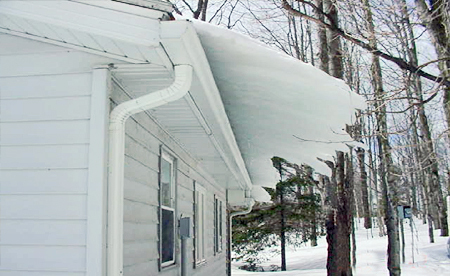 Eventually the ice and snow that has collected in the gutter will severely damage the gutter, soffit and fascia. The potential damage that will occur may greatly exceed the cost of the LEAFPROOF installation. As illustrated, products that are not installed under the shingles leave the roof edge exposed. Ice will collect in this area and will damage the roof edge..."—LEAFPROOF PDF, Click link below to learn more about protecting your home investment. Call or email today to find out our DeWyse Construction, Inc. can install a LEAFPROOF System for you and your family! Our communication and organization skills will ensure that the process of creating your project will be as pleasing as the final product whether you are on-site every day or working with us from a distance. Our customers have lived in the state of Arizona, Florida, Indiana and California and more. Through digital photography and the internet, our customers have been involved and witnessed the step by step progress of their project. If you're ready to talk to someone about making your project happen call us at: (800) 725-9351 and ask for Eric. Copyright © 2019 DeWyse Construction, Inc.. All rights reserved.